IKEA USA $25 off $150+ Coupon! SAVE THE DATE! Starting this Friday, July 14th, 2017 – Sunday, July 16th, 2017 9:30am*-4pm IKEA is offering a long weekend’s worth of special offers, giveaways, workshops and more, all designed to help you get ready for College Life. Plus, IKEA is offering a coupon $25 off $150 or more before tax. Get the coupon HERE! Every day, the first 250 IKEA FAMILY members to show their membership card will receive a free gift! Plus, two lucky shoppers will be chosen daily to receive a $100 IKEA Gift Card. *Restaurant & showroom open at 9:30am, remainder of store opens at 10am. Please see your local store or IKEA-USA.com for store hours. Events and offers not available at IKEA Brooklyn and IKEA Columbus. IKEA Paramus closed Sunday. Food offers not available at IKEA Carson. Looking for items to decorate your classroom with? Right now, Amazon has this Creative Teaching Press Chalk It Up! Calendar Set Bulletin Board for only $9.74 after you clip the 25% off coupon. I'm thinking about getting this for our office as well. WHOAH! Hurry over to Toys R Us where you can save an additional 20% off your entire purchase including clearance items today only. Plus, right now the Journey Girls Limited Edition Celebration Collection Gift Set is on sale for $28.39 (Reg. $69.99), making it only $22.71 once in your cart. Shipping is Free on orders $29 or more so be sure to check out all the great deals and stock up for the holidays. Need a compact stroller? 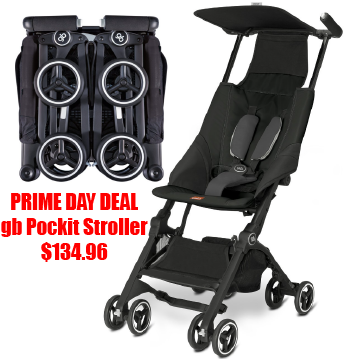 Hurry over and grab the highly rated gb Pockit Stroller, Monument Black prime deal for only $134.96 (Reg. $249.99). This deal is only valid for a few hours. So grab yours before it sells out. If your in the market for a new laptop, hurry over and grab this ASUS Chromebook C300SA Compact 13.3 Inch for only $159 (Reg. $229). I've had ASUS products for years and love them. *This is a Prime Exclusive Deal, while supplies last. The colder weather will be here before you know it. Grab this AmazonBasics Havana Bronze Commercial Patio Heater for only $99.99 (Reg. $129.99). Cat or Penguin Timer $3.99! Need a timer for the kitchen or the classroom? 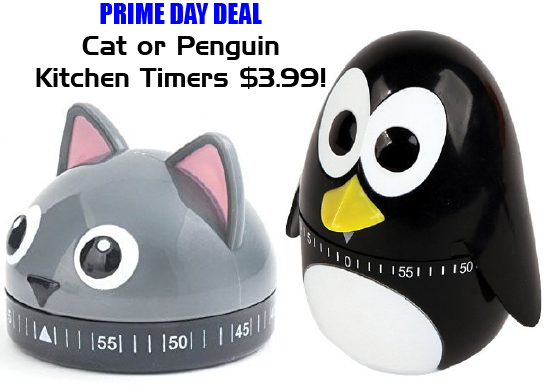 Today only, Amazon Prime is offering the Cat or Penguin Kitchen Timer for $3.99 after 20% off discount at checkout. *This deal is for Prime Members Only! Did you know Amazon has special discounts for items you buy through Alexa? During Prime Day, you can grab the Amazon Echo for ONLY $89.99 (Reg. $179.99) and get in on the additional discounts when ordering through Alexa. That's an all-time low price! It features seven microphones, noise cancellation, a 2.5" woofer, 2" tweeter, reflex port, Alexa calling and messaging, and WiFi with continuous access to the cloud. Not a Prime member? Try Prime today and enjoy fast free shipping, exclusive access to movies, TV shows and music, Kindle books and much more. PLUS the first 30 days is FREE! You can cancel at anytime before the free trial ends. You won’t want to miss Prime Day July 10th – 12th! You can cancel any time after your 30 days if you don’t want to continue your subscription. Having a backup for your computer is a must. Right now, you can grab the Seagate Backup Plus Slim 2TB Portable External Hard drive for only $59.99 (Reg. $76.99). We have one of these and it takes away the worry of my computer crashing and losing everything. *This offer is for Prime Members Only, while supplies last. Now would be a great time to stock up on holiday gifts. Like these Sony Extra Bass Wireless Headphones with App Control for ONLY $98 (Reg. $198). *Offer is valid for Prime Members Only, while supplies last. •Connect easily to your favorite devices via Bluetooth with NFC and enjoy high quality wirelessly streaming with built-in LDAC enhanced codec support. •Choose from black, red or blue to fit your style. Get ready for tailgating season with this Coleman Road Trip Propane Portable Grill for ONLY $99.99 (Reg. $168.99). Offer valid for Prime Members ONLY while supplies last. WOW! If you do any camping, you'll want to hurry over and grab this Coleman Montana 8-Person Tent for ONLY $67.99 (Reg. $219.99). One of my favorite kitchen appliances is my Ninja. I use it for smoothies and even making baby food. Right now, Amazon Prime Members can get the Ninja Professional Blender & Nutri Ninja Cups BL660 for only $69.99 (Reg. $119.99). •Ninja Professional Blender with Nutri Ninja Cups has 1100 watts of professional performance power with 3 speeds, pulse, and single-serve functions. •72 oz. Total Crushing Pitcher pulverizes ice to snow in seconds for creamy frozen drinks and smoothies. •Two 16 oz. Nutri Ninja Cups with To-Go Lids are perfect for creating personalized, nutrient-rich drinks to take on the go. •Includes one 1100-watt base, 72 oz. Total Crushing Pitcher, and two 16 oz. Nutri Ninja Cups with To-Go Lids. Xbox One Bundles as low as: $239.99! Looking for a deal on an Xbox One? Today only, Amazon Prime Members can get an Xbox One Combo for as low as: $239.99. Have a K'NEX fan? Prime Members can grab this K'NEX 100 Model Building Set for only $25.99 (Reg. $49.99), while supplies last. Taking a roada trip? Grab this Portable Crayola, Color Wonder Mess-Free Coloring Art Desk Kit for only $11.81 (Reg. $28.89). This offer is for Prime Members only, while supplies last. Looking for a great deal on a GoPro? Hurry over and grab this GoPro Session w/ GoPro Handler, Samsung 32GB SD Card, AmazonBasics Headstrap Bundle for only $149 (Reg. $202.46). This offer is for prime members only, while supplies last.